Flyer for George Stigler’s 1984 lecture, ‘Economics – the Imperial Science’. Reproduced in: E. Nik-Khan and R. Van Horn (2012) ‘Inland empire: economics imperialism as an imperative of Chicago neoliberalism.’ Journal of Economic Methodology 19(3): 259-282. While not quite as triumphal as the title makes out, the thrust of his post is plain enough: economics will continue to try and invade and occupy the other social sciences. Much of the discussion about econ methods these days revolves around the “credibility revolution”, and the broader rise of empirics in general. Despite scattered protests from various quarters of the discipline, there looks to be no stopping the transformation of econ into an empirical, evidence-based field. But the shift isn’t just healthy – it’s also a golden opportunity for economists to do what social scientists love best, which is to go on a giant raid and conquer the other social sciences! The new empiricism is the amphibious assault ship that will carry hordes of Econquerors (heh) to the vulnerable shores of sociology. This article appeared in Crikey on April 8th. Celeste Boursier-Mougenot "From here to ear (v. 13) 2010". 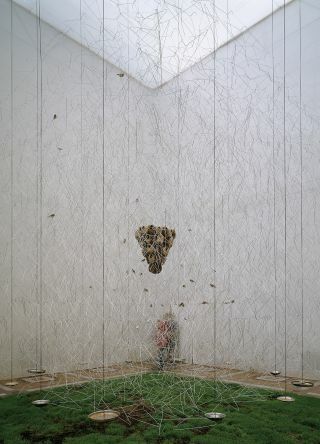 Mixed media, exhibited at the Gallery of Modern Art in Brisbane. Image: Queensland Art Gallery. Your correspondent was in Brisbane last weekend, where he was able to spend a couple of afternoons at the Gallery of Modern Art’s latest contemporary art exhibition, 21st Century: Art in the First Decade. The gallery was filled with people from across the demographic spectrum: young hipster couples, tourists, senior Australians, and families. So many families. This is an exhibition that seems to to capture the imagination of kids, as well as those who refuse to grow up. And who can blame them? This particular vision of art in the 21st century could be criticised for many things (some have even used that most devastating of artworld barbs: “safe”), but one thing you can’t fault is its sense of sheer, innocent joy. 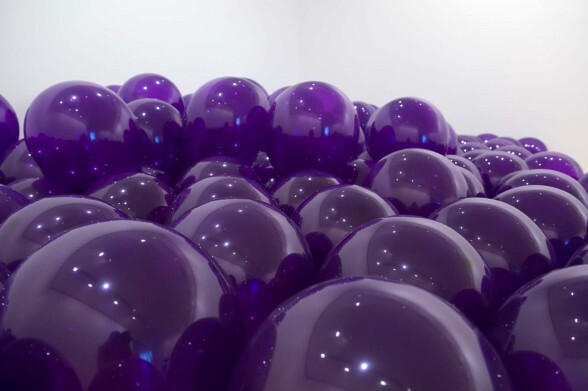 GOMA’s take on the art of the past decade is filled with the interactive, the relational and the funny, from Martin Creed’s room filled full of purple balloons (Work No. 965: Half the air in a given space (purple)) to Carsten Holler’s signature slippery dip Test site, and from Rikrit Tiravanija’s key relational work — a Thai meal for four — to Olafur Eliasson’s giant Lego play pen, The cubic structural evolution project. Of these, Holler’s Test site is something of a signature work of the show, dominating the gallery hall over two levels as visitors enter the space. Crikey’s correspondent was struck by the long stretching lines of kids queuing to go on the slides. Two of the most popular works at the show were interactive and tinged with a sophisticated play of emotions: Rivane Neuenschwander’s wall of ribbons with wishes printed on them, I wish your wish, and the indoor finch aviary of Celeste Boursier-Mougenot’s From here to ear (v.13). Neuenschwander’s work knowingly winked at the unattainability of so many of our hopes and dreams (Crikey particularly enjoyed “I wish I was a famous cricket player”), while Boursier-Mougenot’s work echoes some of the best installation work of the past two decades, such as Hirst’s 1000 Years, and takes it in a sadder, quieter and more sublime direction. The exhibition certainly has several potential flaws. As a show substantially built up from the gallery’s own collection, it has an unashamedly Asia-Pacific focus; many of the works chosen to represent important artists such as Damien Hirst, Tracy Emin, Julian Opie and Chris Ofili are far from the best examples of their ouevre. On the other hand, this Asia-Pacific collection is the gallery’s obvious strength, and has taken on a chilling importance with the recent imprisonment of Chinese artist Ai Weiwei, whose Painted vases are a part of the show. A show such as this is something of a risk for a big gallery — or at least once might have thought to have been — especially in comparison to tried and tested blockbuster exhibitions of old masters. Hence, it must be gratifying for the gallery to mount such a well-attended show, despite the devastating floods of summer. Brisbane’s Gallery Of Modern Art/Queensland Art Gallery complex is now themost popular art gallery in the country, according to recently released figures. It’s indeed interesting that two of the most exciting recent exhibitions in contemporary art in this country have occurred at Brisbane’s GOMA and in Hobart, where the Museum of Old and New Art, or MOMA, continues to wow Australian contemporary art lovers with a collection whose breadth and vision is unmatched in the country (for a recap, have a look at Andrew Frost’s episode of Artscape for ABC-TV). Of course, you don’t need to understand the history of modern art to enjoy 21st Century — and that’s precisely the point. In its large-scale installations for children, in particular, the exhibition demonstrates just how vibrant and enjoyable a commitment to new art can be. This really is living art. We’ve all heard about (though I’ve ot yet read) The Net Delusion. At its core, there is some very smart stuff indeed in The Net Delusion. Morozov is absolutely correct when he forcefully points out that technology isn’t necessarily good for freedom – that it can be used as readily to enslave, surveil, and punish as it can to evade, liberate and share. Unfortunately, this message is buried amid a scattered, loosely argued series of attacks on a nebulous “cyber-utopian” movement, whose views are stated in the most general of terms, often in the form of quotes from CNN and other news agencies who are putatively summing up some notional cyber-utopian consensus. In his zeal to discredit this ideology (whatever it is), Morozov throws whatever he’s got handy at anyone he can find who supports the idea of technology as a liberator, no matter how weak or silly his ammunition. In the New York Review of Books, Charles Peterson uses a review of two books about social networking – Ben Mezrich’s The Accidental Billionaires and Julia Angwin’s Stealing MySpace – as the jumping off point for a long meditation on the origins, nature and character of the social networking spaces we inhabit. Facebook was successful early on because it didn’t depart significantly from how its audience interacted, and because it started at the top of the social hierarchy. Zuckerberg distinguished his site through one innovation: Facebook, initially at least, would be limited to Harvard. The site thus extended one of the primary conceits of education at an elite university: that everyone on campus is, if not a friend, then a potential friend, one already vetted by the authorities. Most previous social networks, such as MySpace and Friendster, had been dogged by the sense that, while one might use them with friends, they were to a substantial degree designed for meeting strangers. But nobody is a stranger in college, or at least that’s the assumption at a school like Harvard, so nobody would be a stranger on Facebook. 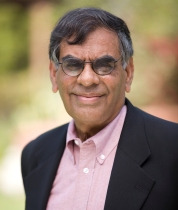 Alladi Venkatesh. Source: Paul Merage School of Business. One of the supplest minds I’ve yet encountered in my cultural research is Alladi Venkatesh (not to be confused with his more famous name-sake, the sociologist Sudhir Alladi Venkatesh, author of the justly celebrated Gang Leader for a Day). Venkatesh’s research ranges across many of the fields I blog about here, including cultural economics, cultural studies, aesthetics and even semiotics. His breadth of reading is constantly surprising, typically bringing insights from many different academic traditions to bear on the questions he researches. And yet he’s not a philosopher or cultural sociologist. He’s a Professor of Marketing at the Paul Merage School of Business at the University of California, Irvine. He’s also Associate Director of CRITO – the Center for Research on Information Technology in Organizations – and the principal investigator of Project Noah. As his bio records, his research focus is on the impact of new media and information technologies on consumers/households. But that doesn’;’t begin to scratch the surface of his work, which pokes its nose into all sorts of fascinating areas. Today we’re going to take a look at one of Venkatesh’s recent publications in the journal Marketing Theory. Entitled “Arts and aesthetics: Marketing and cultural production”, and co-authored with Laurie Meamber, it’s nothing less than a wide-ranging review of the literature in many of the fields we cover in this blog – all from the perspective of marketing. The purpose of this article is to discuss the notion of cultural production within the context of marketing. The position taken is that aesthetic meanings associated with cultural practices are related to the way in which individuals and organizations negotiate commerce and consumer culture. The main contribution of the research is to enlarge our understanding of the cultural production processes as they pertain to marketing and consumption of aesthetics. In this context, we also examine how emerging developments in postmodern aesthetics and posthumanism have augmented new ways of thinking about related issues. The broad research question underlying the article is: Is it possible to view marketing as providing both a context and an institutional framework for the cultural production system in the contemporary postmodern world? If so, what does it entail in terms of our conceptualization of the elements of the cultural production system and their specific relationship to the institution of marketing? 1. What is cultural production and who are the actors involved in it? 2. What are the current approaches within the field of marketing for the study of the cultural production system? 3. What are the significant developments in the area of cultural production that marketing should be concerned with in considering cultural products? 4. What is the role of aesthetics in the cultural production processes? 5. How do the new epistemologies based on postmodernism and posthumanism influence the cultural production processes? 6. What, finally, are the implications of the cultural production processes for individuals, organizations, and consumer culture? The paper lives up to all of these aims, and in the process delivers a tour-de-force introduction to this fascinating intersection of fields. Recommended. It’s fair to say Meaghan Morris is one of my intellectual heroines. Her rapier wit and nimble intelligence make her something a national treasure in the intellectual life of this country. A stylist without peer, she is an ornament to the study of culture. You can therefore imagine my delight on encountering her latest essay, “Grizzing about Facebook,” in the Australian Humanities Review. It’s a carefully argued but effortlessly expressed tip-toe through the vacuous grizzling that so often characterises old media’s response to social networks. I’ve been doing a lot of reading lately of Charles Taylor’s work, particularly his magisterial A Secular Age. This essay seeks to shed light on both the original and contemporary issues about modernity by defining the self-understandings that have been constitutive of it. Western modernity in this view is inseparable from a certain kind of social imaginary, and the differences among today’s multiple modernities are understood in terms of the divergent social imaginaries involved. This approach is not the same as one that might focus on the ideas as against the institutions of modernity. The social imaginary is not a set of ideas; rather it is what enables, through making sense of, the practices of a society. So – what are the modern social imaginaries? Let’s take a brief journey through Taylor’s argument. (It’s worth mentioning here Taylor is talking about “the West” – roughly the industrialising nations of north-western Europe and their colonies in the new world, in quite conscious homage to Weber). The picture of society is that of individuals who come together to form a political entity against a certain preexisting moral background and with certain ends in view. The moral background is one of natural rights; these people already have certain moral obligations toward one another. The ends sought are certain common benefits, of which security is the most important. The notion that God governs the world according to a benign plan was ancient, even pre-Christian, with roots in Judaism as well as Stoicism. What is new is the way of conceiving his benevolent scheme […] what is added in the eighteenth century is an appreciation of the way in which human life is designed so as to produce mutual benefit. Emphasis is sometimes laid on mutual benevolence, but very often the happy design is identified in the existence of what one might call “invisible hand” factors. By this I mean actions and attitudes that we are “programmed” for, which have systematically beneficent results for the general happiness, even though these are not part of what is intended in the action or affirmed in the attitude. In The Wealth of Nations, Adam Smith has provided us with the most famous of these mechanisms, whereby our search for our own individual prosperity redounds to the general welfare. In a future post, I’ll explore perhaps the most interesting of Taylor’s imaginaries, his ideas of “stranger sociability” and their concomitant expressions in political mobilisation, fashion and sexual expression as means towards personal identity making in modern societies.